An easement is a non-possessory right to use another person's property and is typically granted for a very specific or limited purpose. Many different types of easements are used in D.C.: utility easements, right-of-ways, common driveway easements, conservation easements, and so on. 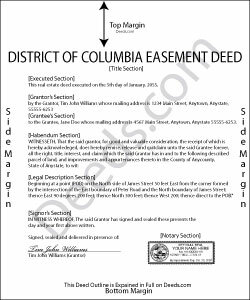 The most common way of creating an easement in the District of Columbia is by a deed or contract in writing, which is known as an express easement; however, implied easements are also used frequently. An easement can also be established by prescription, which requires a claimant to demonstrate that their use of the landowner's property was open, notorious, exclusive, and adverse, and that his use of the property continued for fifteen consecutive years. There are two classifications of easements: affirmative or negative easements. A D.C. conservation easement is a non-possessory interest of a holder in real property imposing limitations or affirmative obligations, for the purpose of retaining or protecting the natural, scenic, or open-space values of real property ( 42-201). A conservation easement is created, conveyed, and recorded in the same manner as other easements, but is exempt from recordation and transfer taxes if the value of the easement does not exceed $100 ( 42-202). An easement deed that is required to be recorded should be signed and acknowledged by the grantor before it is presented to the Recorder of Deeds. A deed that is not properly executed or acknowledged is not recordable ( 42-407). Notarial acts performed within the District of Columbia may be performed by the following persons: a notary public of the District; a judge, clerk, or deputy clerk of any court of the District; or any other person authorized to perform a notarial act ( 42-143). If a notary act is performed in another state by a person authorized to do so, it will have the same effect under the laws of the District ( 42-144). A "notarial act" is defined by statute as taking an acknowledgement, administering an oath or affirmation, taking verification upon oath or administration, witnessing or attesting a signature, or any other similar act authorized by law ( 42-141). Notarial acts should be evidenced by a certificate that has been signed and dated by the notarial officer performing the act ( 42-147). An easement deed affecting real property in the District, or interest therein, that is executed and acknowledged and certified as provided, and delivered to the person in whose favor the instrument is executed, will be held to take effect from the date of delivery thereof. However, as to creditors and subsequent bona fide purchasers and mortgagees without notice of the instrument, and others interested in said property, the easement deed will only take effect from the time of its delivery to the Recorder of Deeds for recordation ( 42-401). When two or more deeds pertaining to the same property are made to bona fide purchasers for value without notice, the deed or deeds that are first recorded according to law will have priority ( 42-406). Wanda R. said: Very satisfied with the ease of using your database. Excellent place to get help with deeds.